Post-apocalyptic movies normally attract my attention and enchant me in general. 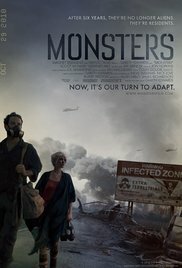 It shouldn’t necessarily be a movie where you are treated all the time with images of total destruction, oncoming hordes of aliens or virus mutated zombies. But this movie really was a slow nerve provoking film that looked more like a road movie or a travelogue on Travel channel that was poured into a cinematic form. The monsters reveal themselves from time to time. Either it’s in a CNN-like way with television reports and eventually close ups at the end of the movie. Mostly you can only hear them making sounds like whales in the distance. The aliens look like walking squids on stilts with an arsenal of disco balls stuck to their bodies. In appearance it was quite something that originated from films out of the years 60-70. Not exactly terrifying. The acting was at times touching, but several times it was just plain boring. The daughter Samantha is a real babe and seems to move around like a model in the jungle. Her acting is limited to an engaging smile, sadly wiping away a tear and walking around in total amazement. A kind of Paris Hilton and someone who, despite her engagement, is attracted to someone else real quickly and starts to get feelings for that person.Photographer Andrew is a very confident guy who constantly tries to be funny and attempts in a terribly predictable way to fall within the grace of his lovely traveling companion. Spending $5000 on a ferry ticket and then they can’t take this ferry because Mr. photographer got drunk and ended up in bed with a beautiful local girl who stole his passport. This seemed so stupid to me that I couldn’t even believe it. They were forced to pay $ 10,000 then and take the most dangerous road to cross the country. The end at the petrol station was the highlight of the movie. Apparently the aliens have abandoned the infected zone. That wasn’t so difficult when you look at the huge gateway in that immense wall. I got a “Close Encounters of the Third Kind” feeling at the gas station and thought that the aliens would start singing after they were fed with the light and suddenly would embrace each other warmly. In other words: pretty disappointing for me, but Mexico does look beautiful at times …..